Tom Hiddleston plays a drunken Dr. Robert Laing in this scene from the film High-Rise. It’s based on a novel by J.G. Ballard and directed by Ben Wheatley. The film is being shown at the Festival du nouveau cinema in Montreal. 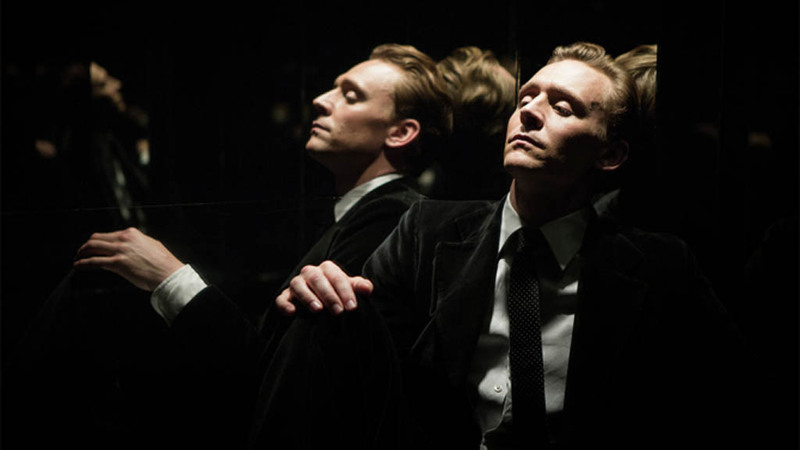 The film High-Rise is being shown twice as part of Montreal’s Festival du nouveau cinéma. The first screening was very close to being sold out – I could only see a few empty seats in the large theatre. What was the attraction? The direction by Ben Wheatley, a story based on a 1975 novel by J.G. Ballard, or British actor Tom Hiddleston? All of the above? OK, then, what about the plot? The film opens with a very dishevelled Hiddleston. His white shirt is dirty and covered in blood, but he’s still wearing a tie. A dog’s leg is turning on a spit. In voice over, he recites the novel’s opening sentence: “Later, as he sat on his balcony eating the dog, Dr. Robert Laing reflected on the usual events that had taken place within this huge apartment building during the previous three months.” Then the words “three months earlier” appear onscreen. Almost everything happens inside the high rise of the title. The building is a concrete monster looming over the landscape. It’s an apartment block, the first of many; others are under construction nearby. There’s lots of exposed concrete inside, too, which gives the place a cold, brutal and primitive look. With a gym, a swimming pool and a well stocked supermarket, there’s no need for tenants to go out if they don’t want to. Of course, some people do have jobs to go to, and in the morning they stride purposefully through the expansive lobby to the equally expansive parking lot, where they climb into their cars. The rich people have the upper floors, while the less well off, the families with their noisy, messy children, live on the lower floors. It’s like a vertical Snowpiercer. (Wish I could be the first to put that in writing.) Unlike the train passengers, the lower classes are not being held prisoner in the building, though. On the other hand, when everything start going to hell in a handbasket, no one considers leaving. The building was designed by Anthony Royal (Jeremy Irons). A symbolic name, I assume. Royal lives on the top floor (the 50th) and has a huge rooftop terrace with grass, trees, a goat, a horse, and who knows what else. Sometimes Royal’s wife wanders around up there dressed like Little Bo-Peep. Royal wears a white, high-collared, shirt-jacket thingy which looks like a cross between white-hunter explorer gear and a retro space-captain uniform. 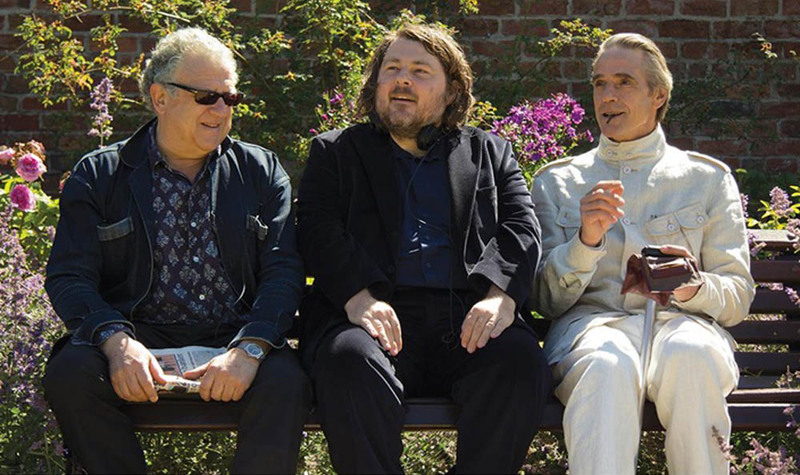 This photo, originally from the Screen Daily web site shows director Ben Wheatley, centre, and actor Jeremy Irons, right. Tom Hiddleston’s Robert Laing, a man who is looking to “start over, begin afresh.” We never find out exactly what he means by that. As a doctor who lectures at a nearby hospital, Laing falls somewhere in the middle on the social scale, though his suits look quite nice and he obviously has aspirations to move up. He is mocked and insulted by some, for that very ambition. Far from being a well-oiled machine, the building is plagued by power failures and elevator breakdowns, because “the building is still settling in.” That’s the official explanation and people repeat if often, in an effort to reassure themselves that the problems are only temporary. 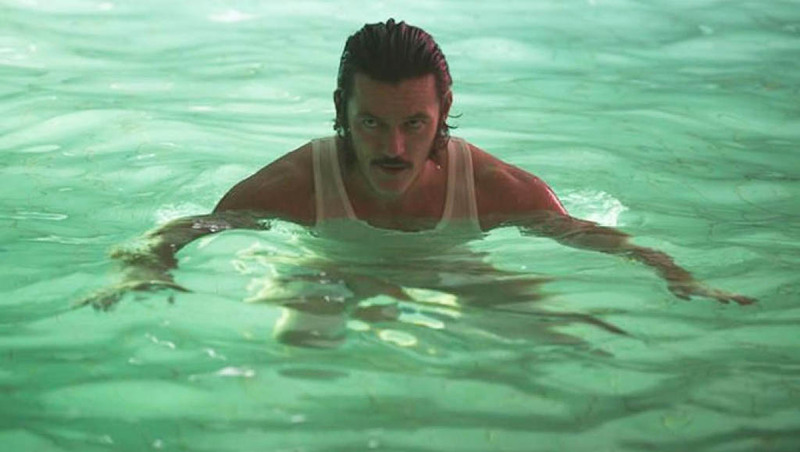 Luke Evans plays glowering Richard Wilder in the fim High-Rise. Philandering TV cameraman Richard Wilder (Luke Evans) wants to capture all the goings on in a documentary. He’s far from an impartial observer, though, he instigates much of the mayhem himself. Sienna Miller plays multitasking Charlotte Melville. She’s the mother of a geeky son, Toby; she’s Wilder’s lover, and Royal’s assistant, (though that isn’t very clear in the film) but she still manages to find time in her busy days and nights to get to know Hiddleston’s Dr. Laing a little better. Many of Hiddleston’s fans read the book while they waited for the film to come out. Viewers who have done that will be at a distinct advantage, because the chaos seems to arrive too quickly in the film. Extra details for the Tom Hiddleston fan-girls: You will see: Steely Tom, Sarcastic Tom, Shirtless Tom, Tom in a suit, Tom in the shower, Tom in nothing and “beardy Tom.” In scenes set in a mirrored elevator, you can see multiple Toms (just as there were multiple Lokis in a scene in the film Thor). Together again: The film is a reunion for Jeremy Irons and Tom Hiddleston who played father and son in the Shakespeare play Henry IV, Part 1, which was shown on the BBC and PBS. Read more about High-Rise on the FNC web site. You can buy tickets there, too. High-Rise, in English, 112 minutes. Directed by Ben Wheatley, written by Amy Jump, J.G. Ballard, with Tom Hiddleston, Jeremy Irons, Sienna Miller, Elisabeth Moss, Luke Evans. Tom moved in to ‘start over, begin afresh’ because his Sister had died.